That’s the opening sentence of a cautionary report published last month by the Institute for Energy Economics and Financial Analysis (IEEFA) based primarily on extensive research by Seth Feaster, an IEEFA data analyst. The report—“Powder River Basin Coal Industry Is in Long-Term Decline”—details how coal producers in the PRB are up against a growing array of market forces that are collectively, and permanently, eroding the domestic market for power-generation coal. Feaster distills the problem number-wise by noting that the power-plant customer base for PRB companies has fallen from about 200 a decade or so ago to 132 in 2018. And he calculates that the amount of coal produced across the PRB fell to 324 million tons last year from 496 million in 2008. 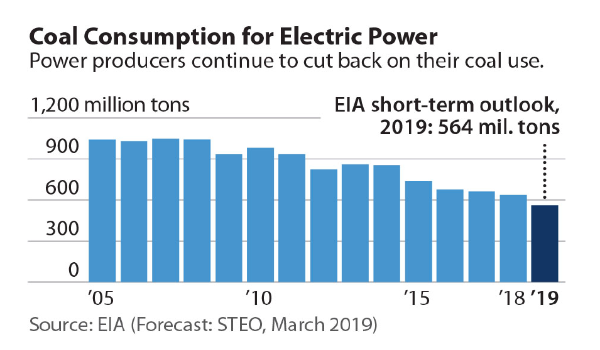 It seems more than likely that this trend will only gain steam, as Feaster and a couple of my other colleagues at IEEFA—research analyst Dennis Wamsted and director of resource planning analysis David Schlissel—note in a broader report published last month too (“Coal Outlook 2019: Domestic Market Decline Continues”). While some industry executives keep talking about how “eventually things are going to turn around,” the fact of the matter is that they won’t. “We disagree, and find that a careful look at the data, the number of plant closures, the sharp decline in domestic consumption and stagnation in electricity demand, as well as the mediocre stock performance of the coal industry can lead only to one conclusion: there will be no turnaround for coal,” write Wamsted, Feaster and Schlissel. Combined, the two reports serve as a warning to the coal industry nationally and an especially dire one to the Powder River Basin, which—back to Feaster’s research on the region’s shrinking customer base—depends almost entirely on domestic demand for electricity-generation coal. The PRB report makes pointed mention of two “long-shot coal industry initiatives” that are pitched more and more as panaceas for the customer-base problem. The first has to do with export markets, which some say will be the salvation of the Powder River Basin. The second involves the as-yet largely unrealized dream of carbon capture. Neither hope is realistic. PRB coal is not of high enough quality to compete in global markets, and that possibility is encumbered by the high cost of getting Montana and Wyoming coal to West Coast export terminals at least 1,000 miles away. Carbon capture remains a mostly fairy-tale scheme, as detailed in yet another recent IEEFA report—“Holy Grail of Carbon Capture Continues to Elude Coal Industry”—that explains the gargantuan technical and financial hurdles such schemes face (see also Wamsted’s IEEFA commentary from March 5, “IEEFA New Mexico: Why Acme’s carbon capture plan for San Juan plant won’t work”). The long and short of it is that the coal-production economies of Montana and Wyoming are in trouble. This is nothing to celebrate, as the impacts are damaging—and will continue to be damaging—to personal pocketbooks, businesses, schools, and all sorts of public services supported by coal-mining revenues. PRB coal production directly employed 5,723 people in Montana and Wyoming in the fourth quarter of 2018, and 1 in 10 households in the eight-county region are supported directly by coal-production employment. These numbers will decline as the national shift away from coal continues. Karl Cates is a JTF researcher and a research editor at IEEFA.